The Eagles' 2018 preseason slate will mercifully come to an end on Thursday night at Lincoln Financial Field. But it's also a special game that should be savored by Birds fans across the country. This will be the last time (ever) that the Eagles will play a home game without a world championship banner hanging overhead. A week from tonight, prior to the season opener against the Falcons, the Eagles will raise their Super Bowl banner. But first, a meaningless preseason game! That's the current total being offered over at Bovada, and since I've been watching the Eagles with my own eyes this preseason, it's incredibly difficult to take the over here. I mean, they were shut out by the Browns last week and even fewer of their actual starters (read: none) will be playing tonight. Either way, I've got to take the under here. The Jets aren't good to begin with, so I doubt their scrubs will light up the Eagles defense, and I just don't see the Birds offense putting up any big numbers either. I'll go 16-13, Eagles. 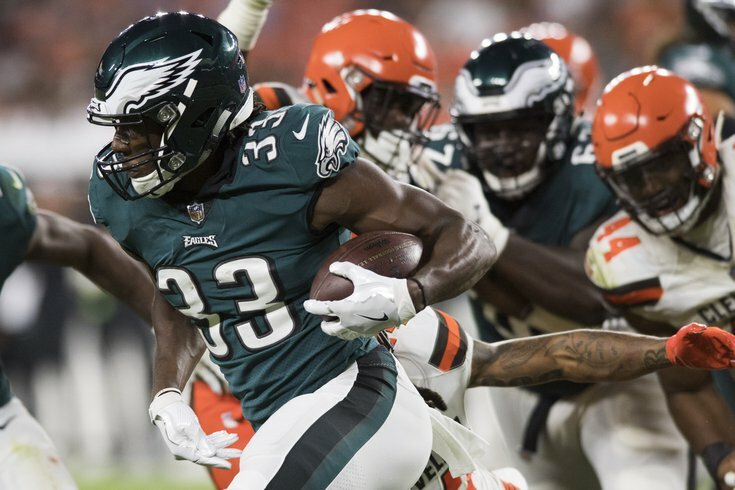 The Eagles have turned the ball over 11 times through their first three preseason games (3.67/game). And if you think that's just due to sloppy preseason play, it's worth noting that their opponents haven't been nearly as careless with the ball, turning the ball over just four times this preseason. Last season, the Birds were one of the best in the NFL in creating turnovers (and had one of the best turnover margins as well). They'll need to get back on track in that department heading into the regular season, and perhaps have a chance to do so tonight against a Jets team that has created just five turnovers this preseason. I asked Jimmy Kempski to set these running back lines, and when he sent back identical numbers for Wendell Smallwood and Donnel Pumphrey (5.5), I decided to group those two together and focus on Adams separately, since Jimmy projected 9.5 carries from him tonight. In order for him to hit the over here, he'll need to match his entire total from the preseason so far (10 carries). I think he gets the opportunities in this one to earn himself a roster spot — although I'm of the belief he's already done that. And that has more to do with his competition than anything else. Smallwood has shown bursts this preseason, but every time he does that, it seems like he's almost immediately injured in some way. Meanwhile, Pumphrey hasn't even had a chance to show anything this preseason, and because of that I think he actually gets more touches than Smallwood in this one. At this point, the Eagles more or less know what they have in Smallwood, whereas Pumphrey hasn't yet played this preseason after missing all of last season with an injury. If they're serious about keeping Pumphrey, who left San Diego State as the NCAA's all-time leading rusher, they're likely going to want to see what he can do in live action. UNDER (a.k.a Pumphrey gets more carries). If it gets any higher than that — and it almost certainly will — you should probably turn the game off. MORE: Eagles vs. Jets: Five things to watch | Eagles 2018 roster: Locks, near-locks, bubble players, and long shots | Doug Pederson sets date on Carson Wentz-Nick Foles decision | What they're saying: Should Eagles be panicking about lackluster preseason?